I did the above post on the three mainstay components of my regimen that I believe have allowed me to retain a lot of length: Moisture, Protection and Strength. I’ve shared how I do these three things over the course of the last year through a variety of posts. Well, I thought it might be a good idea to put the links to these articles all together in one place. As new readers come to discover the site and “old” readers want to find a post that they know they read, but just can’t find, thought it would be helpful to have a “Library” for quick reference. I hope that you agree! If you go through the site, you can see many pictures of my hair parted and styled in a variety of ways. This is a post from last November when I did a tension blow-out. There is a picture with my hair parted in the front and a section was pressed. You can clearly see the hair to my scalp. 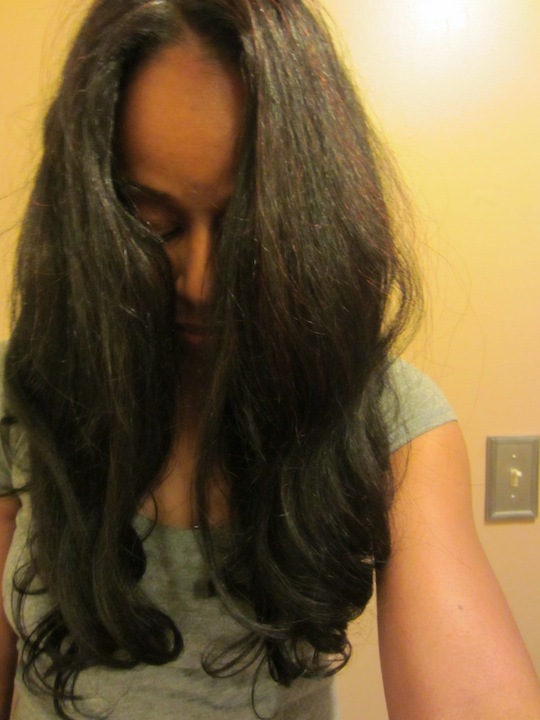 Here is another post from February, when I had my hair pressed. I had parted my hair down the middle to show that a hendigo treatment that I tried failed. If you don’t believe that it’s my hair, that is your prerogative. However, it is and I don’t feel a need to prove it with a special video as there are several videos on my YouTube channel and tons of pics on this site with my hair in various states. I think that they clearly demonstrate that this hair grows from my head. But, again, if you disagree, that is your right and I won’t argue the point. Thanks. omg you should not have even bothered replying this person, some people are unbelievable! You were VERY gracious in your reply in a situation where the person was so rude and undeserving. Kudos. That is a rather weird request…especially to say what Shelli “needs” to do. Why would she post this as a trick? All of her tips were practical, no magic potion or growth pills, nor is she selling anything. Are you serious? Have you gone through Shelli’s webpage and seen ALL her pictures? It is all hers. What would she gain by pretending to have long hair? I don’t want to be rude, but please find other pages to troll. Virtual weave checking? Really? Rude. LMBO!!!!! Oh man Crissa!!!! Love that!!! I am so jacking you for that one!!! LOL!!!! Thank you for a good laugh:)!! That really is a good one! Sad but funny the way you phrased it. There will ALWAYS be that “special someone,” the “Proof Fairy,” to try & discredit what someone is saying. All I know is that I will be trying these tools & techniques on me & my daughter’s hair. Thank you for taking the time, of sharing & explaining the process to myself, & others. Shelli, your hair is fabulous! You are right, you have nothing to prove to anyone. Some people which much rather “attempt” to make another person look bad instead of being happy for their haircomplishments (made me a word!!). Your site and youtube are both full of pictures showing your scalp. Anyway, thank you for sharing and as always…keep inspiring. Your hair is beautiful! 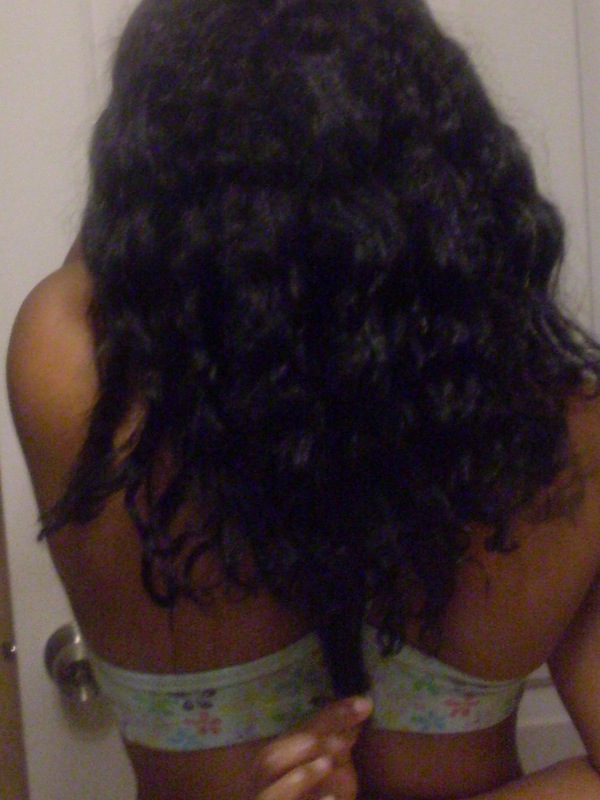 Ever since I was a child, I could grow my hair about half way down my back and it wasnt thin. I also didn’t have to do anything to my hair. I went natural almost two years ago. My hair will grow unevenly past my shoulders. It’s very depressing! I’m really frustrated because my hair is harder to comb now. Your blog gives me hope that my hair will grow back. LOL!!! Awwwwww!! Thank you AmbeeCurls!!! Yea!!! You made it here!!! Hope that you’ll continue to visit as I post a lot more here than you see on CurlyNikki;). I think this is one my new favorite hair blogs! Congrats on all your progress and thank you for the informative posts. Awwwww, thank you lady!!! Welcome, welcome:)!! Hope to “see” you around lots;)!! Awwwww, thank you Mo!! I don’t know if it makes it harder, but I think that all textures can be composed of fine strands that are more susceptible to damage. Sometimes people seem to think if you have a looser curl, it means your hair can grow long easily. And, as you said, that’s not necessarily the case. It’s not the looseness of the curl, but the thickness and strength of the strand, as well as care and manipulation practices that impact length. As you said your hair is the healthiest it has ever been, I’m sure you’ll start seeing it grow to the longest lengths you’ve ever achieved too:)!! Thank you so much for your kind words and hope that you continue to enjoy my blog:)!! I just came across this and I know I’m late-sorry but…Wow Shelli you’re better than me…I would not have responded…but I like your response- very classy! Love your blog and keep up the good work. I really enjoy your blog and taking note of what works and doesn’t work for you. Your length retention is impressive. I’ve reached my hair goal and have set another one. I’m BSL going straight for waist in a year. I’ve retained length but also suffer from breakage. I’m hoping that adopting some of your techniques and combining them with mine will allow me to reach my goal. Keep up the great blogging!! As I sit here with a cap on my head doing a deep condition…I am reading just your pre-poo regimen and I am so lost as to how to do it. Is there a tutorial or video on it? I would love to have the length that you have. What leave in should I use and what do I do with the JBCO? Please help! Thanks Shelli. Joanna, the link to my pre-poo video is above in the post … see 1. Moisture. All those blue bolded titles are links to posts that explain things in more detail. Thanks very much for your information. Your hair looks very beautiful. I have started doing a lot more moisturising treatments, particularly using coconut oil. i love it and im going to try and do this your hair is beautiful! I struggle with length when it comes to my hair. I’ve been natural for two years now. I’ve always had thick hair, but even with a relaxer my hair never seemed to grow past my shoulders. I love your length and really would like to see my hair get there one day. I love this post and your blog. Thank you so much Vickie!! Well, I hope that you find information here that helps you achieve your goals!! I love your hair and the information that you give. I have always transitioned between wearing my hair straight and natural curls, however somehow last year, I was wearing it straight by using a straightening foam by Bed Head and a flat iron, it always reverted back to my curls but now, on the left side, there are a ton of stick straight pieces. It’s not dry, and there is no shedding, or breaking so I’m not sure if that’s heat damage or if it’s just been trained but I’m looking for something to fix it. Does the “Z” from Mahandi actually help with that or will I just have to grow and chop? Awwww, thank you so much Lovely! As to the zizyphus, I think that works on hair that has been weighed down by henna because it lifts some of the dye deposit. I don’t think that it’ll restore curls lost due to heat damage. But, you know, it’s not too expensive and it might be worth trying! But, just make sure to condition after using it as it works like a clarifier and can be drying. Speaking of clarifying, have you done that? Sometimes hair gets limp because it has product build-up, though, it does sound like you have heat damage since the straightness is in a localized area. Heat damage doesn’t necessarily cause the hair to break or shed. It just changes the structure of the hair. Have you tried doing a protein treatment (followed by a moisturizing DC). Protein helps put “structure” back into hair and the moisturizing DC helps restore elasticity. If the damage isn’t severe, that may help restore some of the curl. Okay, HTH!! 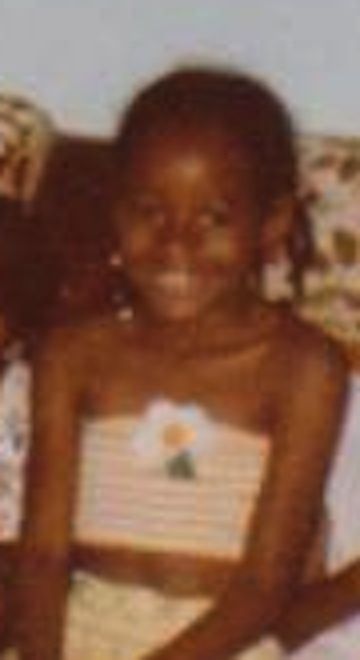 Did you go to cosmetology school?Im 14, My hair and my familys hair is pretty close to african hair since we got a relaxers,my mom,my sisters and myself have been going naturaul for a year now,the relaxer really jacked our heads up,our hair has shortened a lot,(like shorter than ear length)Will all these tips grow our hair long and silky like yours?Will the methods still work? Hi there! Lovely blog and hair indeed! I am very much so interested in trying out some henna. I’ve been on my journey for 2 years 6 months and I’ve grown to enjoy it although challenging. I did the big chop and had less than an inch. Now I think I’m between 8 and 10 inches throughout. I keep my hair in two strand and flat twists often, but I think I’m ready to see if I can reap some benefits from henna. I’m doing my research before hand though. I just wanted to share that with you since you are gracious enough to share yours. Thank you! How can I get my edges to be straight again? Before my hair was permed my edges use to be smooth and straight and now that I have natural hair again I can’t get my edges back!!! It seems to always be dry no matter how much I moisture. What should I do? Dani, did you have issues with your edges when you were relaxing and how long have you been natural? 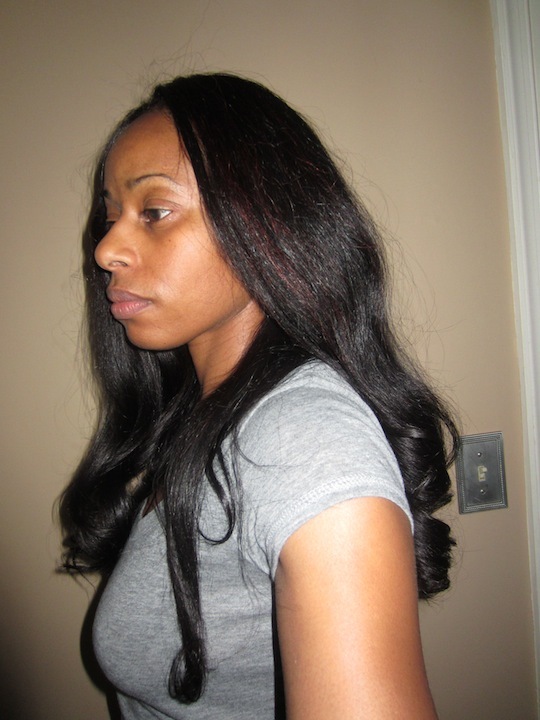 Sometimes people experience damage from relaxers around their edges due to over processing or too frequent relaxers. How is the skin in that area? Is it darker? Is your hair density the same or thinner? If you are more recently natural, I have heard people talk about what is referred to as “scab hair.” There is conjecture that the first “new growth” that you grow after relaxing may not be your true texture if the scalp has been damaged from relaxers and that, when you cut off that initial growth, you’ll see your “true texture.” So, if you haven’t been natural for long, that could potentially be what you are experiencing. Regardless though, are you pre-pooing and deep conditioning your hair weekly? If not, you may want to try those steps and focus on your edges. Make sure you are using a leave-in conditioner and seal with something that keeps the moisture in. Also, be careful with the fabrics you use against your edges if you use headbands and wear a silk or high quality satin scarf and/or a silk/satin pillowcase for bedtime, making sure your edges are adequately covered. I have been natural now for 5 years and my texture still isn’t what it use to be! I don’t remember ever having problems with my edges while relaxing and I don’t have any problems with it now. Its not darker either i just checked. The hair at my edges is definitely thinner, as a matter of fact the hair at the front won’t grow out. It just stays in curly balls instead of growing out straighter. I’ve pre-pooed only twice but I still moisturize regardless. Every week I wash, deep condition, use shea butter as my leave-in,air dry and put my hair in a bun to protect it. At this point I’m so frustrated because shea butter doesn’t work and edge control is only good for one day. Shea butter is not a moisturizer, so it wouldn’t be an effective leave-in. It’s a sealer. A leave-in should have water as the first ingredient. You can use just water, but I found that wasn’t effective for me. 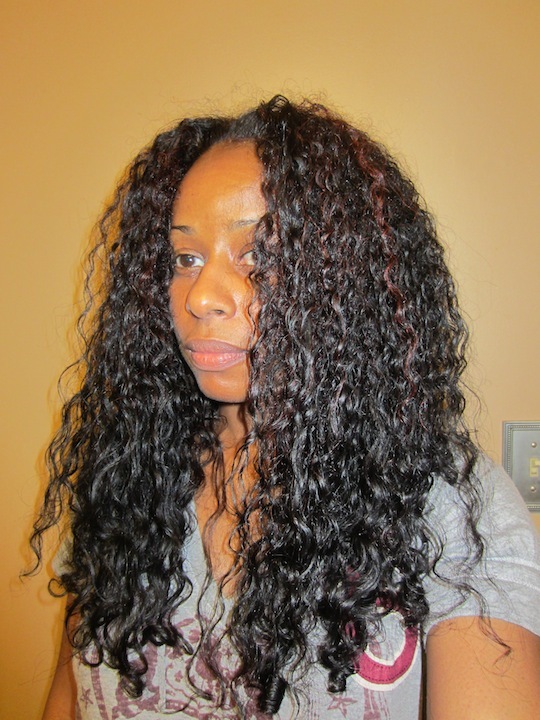 As to smoothing/holding your edges, I’ve been using ORS Lock and Twist gel and really love it. But, I tend to reapply daily. I haven’t found anything that works for more than a day or two at most to keep my edges smooth … but I also work out/sweat daily. Oh, Cantu Leave-in? You said Shea butter, so I thought you meant PLAIN Shea butter. Lol. Then yeah, that would be a moisturizer, but doesn’t sound like it is working for you, so you may want to try other leave-ins. If you’re pulling your hair into a bun, are you doing it tightly and always in the same position? If so, that can put a strain on your edges and cause them to thin and break. As to the texture change, the only thing I can say is that they say our hair texture can change every 7 years or so. I don’t know if that us a price scientific fact, but I do know my hair seems to have changed from my 20s-30s. And it really changed in my late 30s, though I think it had more to do w/diet and henna. Sorry I couldn’t be of more help. Oh no, you just made me realize that I probably put strain on my edges because I do put my hair in a bun everyday!!! Lol. 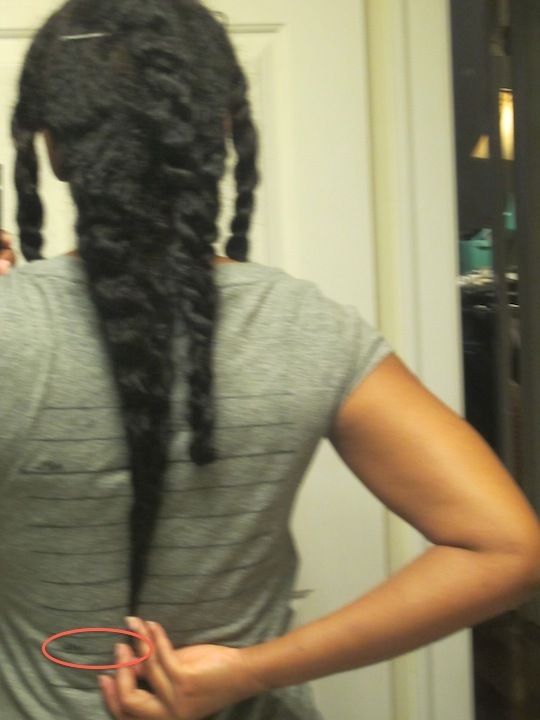 But it’s what I do for a protective styling..so I’ll try to remember that next time. I have one last question though… Do you think it’s possible that my edges need some protein? Because I looked at it and noticed that the root is curly but the end is straight. I was so confused by this, but then I thought maybe I need amprotein treatment to strengthen and balance the ph. You think so? Hi Dani, curly usually means your hair has enough protein and straight means it is over-conditioned. But, that is just the norm. Only you will know your head of hair the best. Usually people are trying to get their straight hair to curl (when natural) and not the other way around as straight natural hair usually means heat damage and/or over-moisturized hair. So, since I don’t know your hair, I really don’t want to recommend one way or the other on that. You have to do what you think makes sense and works for you from experience. But, definitely … pulling your hair back tightly every day into the same hairstyle (and brushing your edges, if you do that too), will put strain on them and can result in damage. Sorry I couldn’t provide more help on that one. Good luck! I’m in love with your blog and so happy I found a home for information! There’s just so much info out there (you tube, ect) and it gets overwhelming at times. 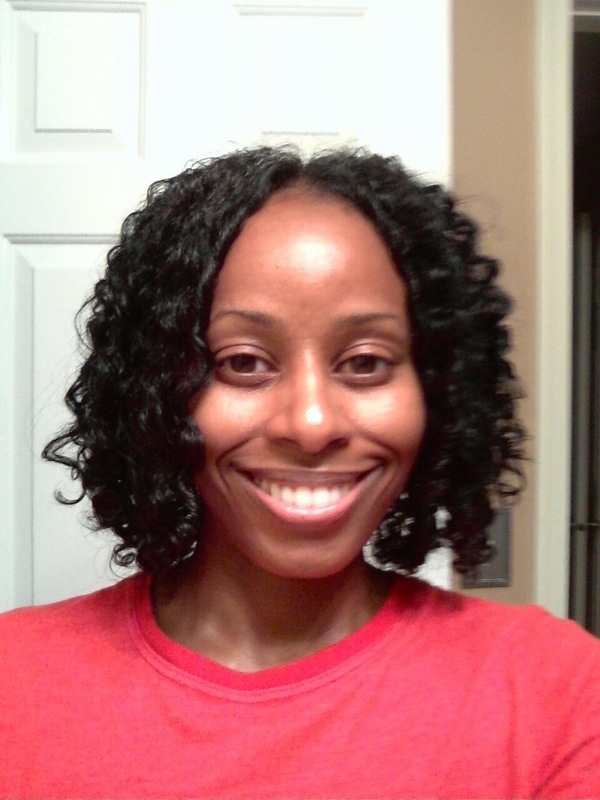 I’m a newbie natural – big chopped after a 6 month transition from relaxer just last week, so i’m just 9 days in. I’ve been co-washing every day (deep conditioned with honey, mayo and aussie Most mid week). Is it okay to co-wash every day or is that too much manipulation? i want to retain as much as I can so i can start to see some length. Thanks! Hi Mninij!! Awwww, thank you so much!!! So happy that you discovered my blog and find it helpful!!! As to co-washing daily, for naturals with shorter hair, it can be okay. But, in the long term, soaking the hair in water daily can be damaging and, if you are not incorporating protein into your regimen, you can also end up with over-moisturized hair that can become mushy. That’s not to say that you can’t wet your hair daily to refresh your curls. But, fully saturating it with water and conditioner may not be necessary. You may want to try just letting the moisture from the shower dampen it or use a spray bottle and then apply some conditioner to your hair (I would recommend a leave-in over a rinse out conditioner, if you can find one that you like. But, if you can’t, plenty have success with regular conditioners too and I say, do what works for you). As to the gel, KCCC does not have drying alcohols. So, as long as your gel doesn’t contain agents that make your hair feel dry (with it in or after you rinse out), you should be fine. I have a post on here about Product Ingredient basics that break down the different types of alcohols (fatty and good versus drying and bad). There are also a couple of posts on protein conditioners and over-moisturizing in the right-hand navigation. HTH!! Thanks so much for the advice! I did not co-wash this morning, just used the spray bottle with water/ coconut oil and a little Cantu curling custard …that spruced me right up. I’ve seen your post regarding balance (Protein & conditioning) and will keep all that in mind. Thanks again!!! ‘be Hey Shelli, Just came across your blog and i LOVE it. I’ve been natural all of my life, I’ve had locs since I was 8 and cut them off a year ago at 22. So for a little over a year now I’ve been growing my hair and I’d say its maybe Arm Pit Length, but for some reason I think my growth has halted. I don’t use heat regularly (my last time was in July for my moms wedding and the stylist was awful with my hair and the heat), and I recently tried box braid extensions for the first time, thinking it would help me retain length. I moisturized daily, covered and protected at night with my bonnet, everything just in hope to retain length. But, after taking them out after about 5 weeks, I’m experiencing a great deal of shedding still (after about a week of taking them out) and I really feel as though my hair is at a plateau. When I do a length check just by pulling the strand, it still seems as if its as long as it was back in July when I last straightened. I co wash every week, DC every week, I don’t do protein tx’s as often but I don’t feel as though my hair is limp. I keep it moisturized and sealed. I wear mostly twist outs and usually I bun it up (lol) a day or two before wash day. Nevertheless, I still experience a great deal of breakage :/. I’m not sure what I’m doing wrong and I’m starting to feel a little discouraged. I’ve been looking into henna to maybe strengthen and help with my thin strands, but any advise or post you recommend me to read would be wonderful. Do you wash after the pre-poo or after the deep condition? I really don’t redo my twists/twist-out. Once it doesn’t look good anymore, I start wearing it in a bun. Too much manipulation/re-twisting results in breakage for me. It may look nice for the short-term, but it’s detrimental to length retention and I’m still aiming for full thickness tailbone length. Yes, too many full strength treatments would loosen my curls, so I started roots only once I realized this.